Outlined in a support document posted to Apple's website, the company recently determined certain late model MacBook and MacBook Pro units exhibit keyboard functionality issues that include unexpectedly repeating letters or characters, letters or characters that do not appear after a key is pressed, and key or keys that feel "sticky" or do not respond to input. While not specified in the document, the list includes every Apple laptop with a butterfly key mechanism. Apple or an authorized repair shop will examine user MacBooks to determine whether the unit is a candidate for service and, if so, replace problematic keys or the entire keyboard. Owners who already paid for eligible keyboard repairs can contact Apple to request a refund. Apple's coverage applies to MacBook units up to four years after their first retail sale. The program arrives as a growing number of customer complaints question the reliability of Apple's butterfly keyboard. The low-profile switch design debuted with the 12-inch MacBook in 2015, while second-generation switches arrived in the MacBook Pro line the following year. Last year, however, customers began to report issues with the switch architecture, saying small amounts of dust and debris would render keys inoperable. Apple indirectly acknowledged the issue in a support document outlining a method of cleaning affected keyboards with a can of compressed air. Anecdotal reports claim the technique rarely works. Customers who encounter the issue, and who are no longer covered by Apple's gratis one-year warranty, are faced with two options: pay for a pricey repair or be left with a non-functional computer. AppleInsider investigated the issue in April. 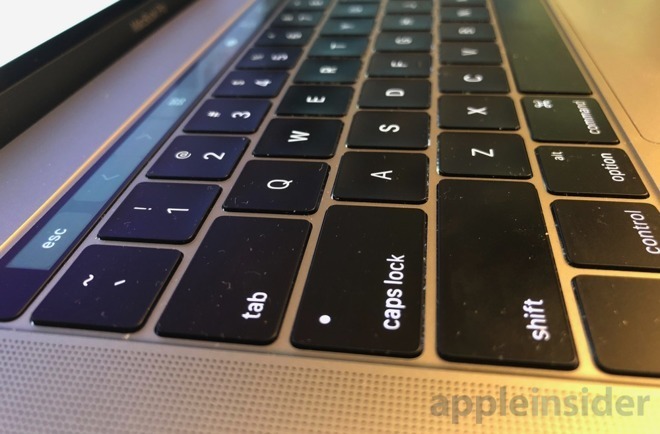 According to data from Genius Bar locations and authorized third-party shops, the 2016 MacBook Pro's keyboard failed roughly twice as often in its first year of use as 2014 and 2015 MacBook Pro models with scissor-type switches. Current 2017 model year versions fair a bit better, though the model has not been available for a full year. Shortly after the report was published, Apple was hit with a class action lawsuit claiming the butterfly keyboard design is inherently flawed. According to filing, "thousands" of MacBook and MacBook Pro owners have experienced some type of failure with Apple's butterfly keyboard that renders the machine useless. A series of related class action complaints were subsequently lodged, and continue to be filed, in California District Court, each detailing nearly identical failures related to Apple's key switch design.